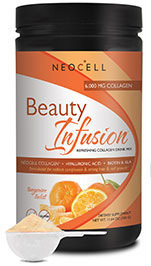 Beauty Infusion - Tangerine Twist, 11.64 oz (Neocell) - Penn Herb Co. Ltd.
50 mg of Hyaluronic Acid for skin hydration & renewal. 3,000 mcg of Biotin for support of strong hair & nail growth. Alpha Lipoic Acid & Vitamin C for protection from free radical damage & enhancement of collagen formation. Collagen drink mix formulated for radiant complexion, strong hair and nail growth (Diminished collagen levels in the body can lead to loss of elasticity in the skin, thinning hair, and brittle nails). Dissolve 1 scoop of powder into a glass of water or non-dairy drink of choice. For optimum absorption, take on an empty stomach. IF YOU ARE PREGNANT, NURSING OR HAVE A MEDICAL CONDITION, CONSULT YOUR PHYSICIAN BEFORE USING THIS PRODUCT.